After Hewlett Packard Enterprise has missed offering a Microserver in their 9th Generation, it is now back in Gen10. The Microserver series provides affordable servers intended to be used in SMB and as home servers. Due to its low price and power consumption, you can find this system in many virtualization home labs as ESXi hosts or Storages. 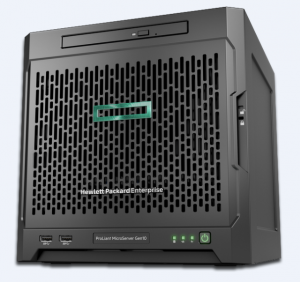 The HPE ProLiant MicroServer Gen10 is available with two different CPUs - AMD Opteron X3216 and X3421. Both models a SoC which means that the CPU cannot be changed like the Intel CPUs in Gen8. They support up to 32GB of unbuffered DDR RAM. The server can be equipped with 4 hard drive from the front. Call "HostServiceSystem.Restart" for object "serviceSystem-[*]" on vCenter Server * failed. cpu*:*)WARNING: Heap: *: Heap_Align(globalCartel-1, 136/136 bytes, 8 align) failed. WARNING: Heap: *: Heap globalCartel-1 already at its maximum size. Cannot expand. Hewlett Packard has released Intel Xeon E5v3 (aka Haswell) Proliant Generation 9 server systems. Gen9 Servers are available as Rack Servers, Blades and Towers. Time to have a look at VMware Support for the new series.